Isle of Man TT hat-trick hero Ian Hutchinson will hope to bridge a five-year gap by claiming a victory at this year's Ulster Grand Prix at Dundrod. The 35-year-old secured a treble at the international road race in 2010 but missed the following three years, before returning to the event in 2014. The Bingley rider is keen to make up for lost time however after completing his long road to recovery from injury. "I've missed more track time at Dundrod than at the other big races," he said. "The way my operations and recuperation fell I was able to compete a few times at the North West 200 and TT, but missed out on the Ulster, which is one of my favourite circuits," explained the Yorkshireman, who underwent 30 operations on a serious leg injury. Hutchinson, with five UGP wins to his name, will compete for the Paul Bird Motorsport Kawasaki outfit in the Superbike and Superstock classes, switching to the Traction Control Yamaha, sponsored by Prodigy frontman Keith Flint, for the two Supersport outings. He will face stiff competition however from a wealth of top road race stars, including New Zealander Bruce Anstey, 11-time winner Guy Martin and the Dunlop brothers, Michael and William. Anstey, with 10 triumphs, has been on the podium at least once every year since making his debut in 2002, and has held the outright course record at 133.977 mph for five years. The 46-year-old Kiwi is joined in the Valvoline Padgett's Honda awning by Manxman Dan Kneen, who enjoyed a maiden international success in the Superstock event last year, seeing off Dean Harrison by just one thousandth of a second. Like Anstey, charismatic Lincolnshire rider Martin is competing for his team, Tyco TAS, for the fifth consecutive season, this time aboard BMW Superstock and Superbike machinery. 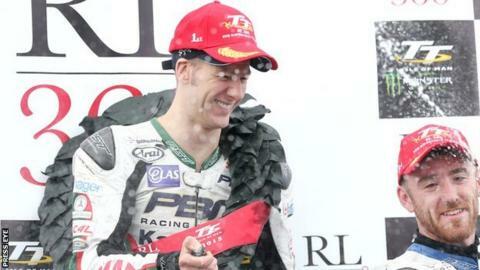 The 33-year-old mustered just one rostrum finish at the TT, but was crowned Southern 100 Solo Champion for the third year in a row at Billown, and also took a 'big bike' victory at Armoy. Michael Dunlop's efforts have been hampered by a shoulder injury sustained in an Isle of Man Superbike TT crash in June, which came just days after a dramatic split from the Milwaukee Yamaha team to revert back to BMW. The 26-year-old will be keen to make up for drawing a blank at Dundrod last year, but showed that he hasn't lost the winning habit by seeing off his rivals to seal Superbike wins at the Southern 100 and Armoy during July. His elder brother William has been similarly struggling after suffering rib injuries in a practice crash at the TT, but has remained in dominant form in the Supersport class on the Irish roads, winning at Skerries, Walderstown and Armoy since coming to grief on the Mountain Course. Tyco BMW and CD/IC Racing Yamaha racer William currently boasts seven Ulster Grand Prix wins, to the six achieved by his younger sibling. Honda Racing pilot Conor Cummins missed the 'Ulster' through injury last year and the former lap record holder will want to make up for a largely disappointing 2015, allayed to some extent by a sixth place finish in the Senior TT. Northern Ireland's Lee Johnston will look to improve on his second-place finish in the Supersport race in 2014, aboard East Coast Racing BMW Superbikes and Superstocks and a Triumph Supersport, having occupied the top step three times at the North West in the last two years. Meanwhile British Supersport regular Glenn Irwin, from Carrickfergus, is set to challenge strongly in the 600cc and Supertwins classes, having impressed on his road race debut at the 7.4-mile County Antrim course last year and again at the North West 200 in May. Mar-Train entrant Dean Harrison has spent the season getting to grips with the new version of the Yamaha R1, but a lap at over 130mph in the Senior TT in June will offer the Bradford man hope that he can improve on his previous best Dundrod placing of second in last year's Superstock. Peter Hickman exploded onto the road racing scene in 2014 by becoming the fastest newcomer at all three international circuits and went in to perform well at this year's TT after missing the North West because of injury. Another of the Lincolnshire contingent, Ivan Lintin, should contend in all classes, especially the Supertwins, while Scot Keith Amor will be out to add to his solitary victory in 2010. Other riders expected to feature strongly include course debutant Horst Saiger, Republic of Ireland national road race regulars Derek Sheils and Derek McGee, and English pair James Cowton and Connor Behan. Dundrod 150 races - Thursday - National Race (5 laps); Ultralightweight/Lightweight race (5 laps); Supertwins (5 laps); Challenge Race (5 laps); Superbike race (6 laps). Ulster Grand Prix races - Saturday - Superstock (6 laps); Supersport (6 laps); Ultralightweight/Lightweight (5 laps); Superbike feature race (7 laps); Supersport race (6 laps), Supertwins (5 laps); Superbike (6 laps).